Hey you guys!!! 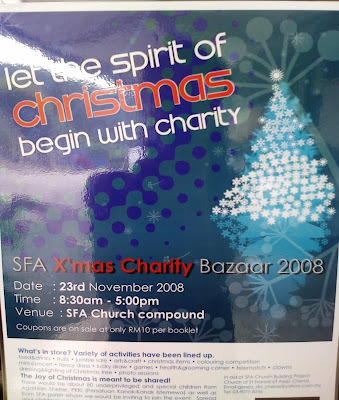 There’s a charity bazaar around the corner. No entrance fee required.. just buy coupons for that day itself. Only RM10 per booklet. Buy as many as you want, as you can. In each booklet, you’ll find tokens which you need to buy food, gifts, take part in events, etc on that particular day. Be it buying for yourself or get into the charity event where about 80 underprivileged and special children from Agathian Shelter and PKKI (Persatuan Kanak-Kanak Istimewa) will be present to come together as one for this special event. You can adopt a child just for the day and shower him/her with love!!! All proceeds goes to charity without doubt!!! SFA Christmas Bazaar 2008 LEJADI’s Charity Night Q-Dees Annual Concert 2008 W.T.F.